Service Untitled» Blog Archive » U.S. airlines improving customer service? U.S. airlines improving customer service? The trade industry organization Airlines for America has reported customer service for airlines improving in three different areas. Travelers are always interested in improved customer service, so therefore any news in the airline industry is always considered good news, but alas have there really been improvements or is it just better defined as happenstance? The Department of Transportation reports the number of passengers bumped from flights decreased to 0.81 per 10,000 passengers – a decline of 1.09. The airlines contend better planning, but the Wall Street Journal attributed the decrease to DOT doubling airline penalties to passengers who are involuntarily denied boarding. 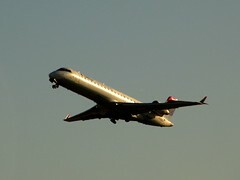 And finally the report states that U.S. airlines have had the best on time arrival rates – up by 85.07 percent. One has to question whether the airlines have changed and improved employee policies, improved maintenance on planes thus avoiding long delays, or has the lack of inclement weather this winter just been a greater part of that improvement? Never mind that there is less sky traffic, oil prices are way up and less people are traveling by air because of the weak economy. We do know that traveler complaints continue to apply pressure to the airline industry forcing them to make improvements, however consumer complaints on both domestic and foreign airlines have risen in the past year. The Department of Transportation received 11,545 complaints – up 5 percent from 10,988 in 2010. Many of the complaints arose from foreign carriers, and an especially high amount of complaints concerned the apparent lack of customer service for passengers with physical disabilities. We of little faith periodically wonder if airlines will ever succeed in doing it better. With so many variables to consider for every flight, mistakes are bound to be a reoccurring pattern, however more personal considerations need to be addressed at the ticket counter, check-in, on the aircraft and at the terminals. It is how the human factor handles many of these problems that make the frustration and ultimate anger resulting in the constant multitude of complaints. Do you want to know the best airline considered the number one on-time carrier for the eighth straight year? According to the Department of Transportation, Hawaiian Airlines scored 92.8 percent on-time performance. When asked how the airlines achieved such a remarkable achievement, the company heartily thanked the dedicated Hawaiian employee performance. Let’s hope the other airlines follow suit. Good customer service is important for every industry but even more so with the economy still so tight. With many other businesses to choose from if you don’t stand out and actually listen to customer complaints than customers will just find someplace else to go.